Halfway through the month, we in the temperate zones are clearly moving from one season to another. Here in New York, the warm portion of October may be naught but a memory. Wherever you are, get excited for whatever comes next, because it’s coming! In the absence of notable rarities this weekend, I took greatest pleasure in observing big Red-tailed Hawks, which are always awesome despite their ubiquity. Corey’s Best Bird of the Weekend was one that he unfortunately failed to photograph, a Dickcissel at Jacob Riis Park in Queens. 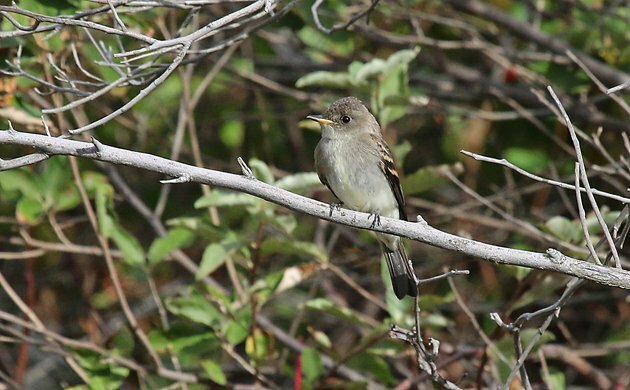 Fortunately, he managed to snap a shot of a relatively late Eastern Wood-Pewee as a stand-in. My best bird of the weekend was a Golden Eagle at Jamaica Bay NWR Sunday. I’m traveling in Spain and have loved seeing the large and gorgeous Red Kites! Red-headed Woodpeckers on Jamestowne Island, Virginia. Plus Red-shouldered Hawk, American Bittern, Seaside Sparrow and more and more. The woodpecker story will be on my blog soon along with other goodies from around Williamsburg Va..
Click on my name above to read about them all. Corey may have his Golden Eagle, true, but I’m pretty content with the handful of Green-winged Teal that were scooting among the Wood Ducks at Heinz NWR just south of Philly. So resplendent in the morning sun, and got me excited for duck season again! I got my first ever photo of a Shining Bronze-cuckoo! Only the third I’ve seeb in NZ!